SofStop offers custom column pads that are designed to offer full protection against impact collision. These free-standing column pads are engineered with 2”, 3” or 4” thick foam. SofStop can manufacture these pads to your specific requirements. Column pads are easily installed using 2” vertical Velcro hook and loop closures. 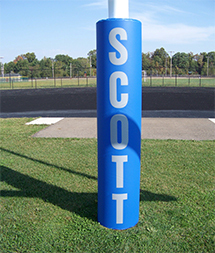 SofStop’s custom post pads can be installed around any post where body contact may occur. Using a variety of thicknesses, SofStop can fabricate a post pad specific to your requirements. With common applications being basketball backstops and football goal post, these pads are easily installed using 2” vertical Velcro hook and loop closures. SofStop wood-backed corner and column pads are custom manufactured to your specific dimensions. Simply identify the measurements of each corner, the returns and face of each column, along with the height; foam type and thickness must be determined. Large corners and columns are shipped with wood bracing for protection, if needed. For those applications that require special cut outs around light switches, electrical outlets, windows or other impediments, SofStop provides safe and effective solutions. If your requirements call for wall padding to be manufactured without woodbacking, SofStop can meet these specifications. This sewn pad is made to a standard 2′-0 wide dimension x 4′, 5′, 6′, 7′, 8′, 9′ & 10′-0 height while using one of our 18 colors of 14oz. PSY fire retardant vinyl laminated polyester (Fire Retardant to pass California State Fire Marshall’s Test and NFPA-701). Two inch velcro is sewn to the back side of the padding for easy installation. SofStop can produce sewn corners on your standard and custom padding, whether you require nailing margins or not.